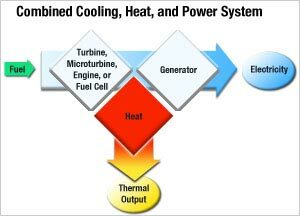 Combined heat and power (CHP), also known as cogeneration, provides thermal energy for buildings or processes while simultaneously generating part of the electricity needed at the site. On-site CHP is a time tested, proven technology that offers many important benefits to building and facility owners. Process flow for a typical CHP system leverages heat created during electricity generation to further decrease facility energy demand. A CHP system recovers heat from electricity generation for productive uses such as heating, cooling, dehumidification, and other processes. This heat is usually wasted at conventional power plants. A properly designed CHP system can be more than twice as efficient as the average U.S. fossil fuel power plant. Growing numbers of facilities are turning to CHP technologies to gain greater control, reliability, supply quality, and flexibility in their power systems. Gas turbines are typically used in larger facilities with electric loads larger than 4 MW. Gas turbines are similar to jet aircraft engines and are commercially available in sizes from 1MW to over 100 MW, with the larger sizes used in utility power plants. These turbines produce large quantities of thermal energy in the form of steam, which can produce total efficiencies of 90%. Microturbines are small turbines based on the design of turbochargers used in commercial vehicles. They are commercially available in sizes from 30kW to 1000kW and can be connected together in series to produce many different size combinations. The electrical efficiency ranges from 28% to 33% and the waste heat is typically used for hot water or through an absorption chiller (direct fired or through a hot water heat exchanger). They can reach total efficiencies in the 60% to 70% range. They are extremely reliable because they have such a small number of moving parts. Microturbines typically run on natural gas although they can be designed to run on other liquid and gaseous types of fuel. Fuel Cells are becoming more popular due to their high efficiency and low emissions. The cost for fuel cells is significantly higher than other prime movers and reliability has been an issue in the past. Although the technology has been developed for some years it has only been pursued commercially to a great degree in the past 5 years. A fuel cell is an electrochemical device that converts hydrogen into DC electricity with heat and water as by-products. The source of the hydrogen for the fuel is typically natural gas. Fuel cells are practically emission free, they operate at very low noise levels, and can respond quickly to changes in electrical loads, however not all are adaptable to CHP. IC engines are typically used in systems that are 1 MW or smaller. Most people are familiar with IC engines as power for automobiles. IC engines are available in sizes for 50kW to 5MW are able to use all kinds of liquid and gaseous fuels. They are classified as rich burn or lean burn depending on the air to fuel ratio. Waste heat can be recovered in the form of hot water or low pressure steam. IC engines usually provide the lowest cost of all of the prime movers. Although IC engines are reliable due to years of production and testing, they contain many moving parts which require more maintenance than other prime movers.